The days of 3D printing as solely a rapid prototyping tool for the automotive industry are over. Advances in additive manufacturing mean that today, automakers are increasingly recognising the benefits of AM as a means of producing complex, functional components optimised for performance and weight reduction. From reduced lead times and production costs to simplified supply chains, 3D printing provides a range of benefits for the automotive industry. In the latest in our industry series, we’ll explore the benefits of 3D printing for the automotive industry, and the opportunities going forward. 3D printing can be used to create complex, intricate designs that would otherwise not be possible with traditional manufacturing methods. This capability is particularly beneficial when creating customised functional parts. Since geometry is a key variable affecting a part’s weight and performance, the design flexibility of additive manufacturing provides an ideal way to produce highly complex, lightweight components. The possibilities of this capability are endless, with automakers being able to create faster, lighter and better-optimised vehicles. 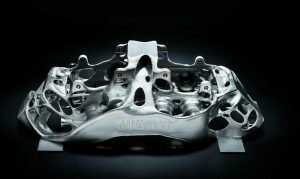 As weight reduction is a key area of concern for automotive OEMs — lighter vehicles typically have a lower fuel consumption — design engineers can also benefit from tools like topology optimisation and generative design. These can be used to remove material in specified areas and create parts with optimised weight and performance. Part consolidation is another way in which automotive OEMs can benefit from 3D printing. Since traditional manufacturing methods lack the design freedom of 3D printing, multiple components must be typically be produced to create a part. 3D printing simplifies the assembly process by reducing the number of components needed at the assembly stage. Overcoming the need for multiple parts helps to reduce both material usage and assembly time/costs. With manufacturing leaning ever further towards mass customisation, automotive OEMs must increasingly find ways to create vehicules tailored to the needs of their customers. 3D printing offers a cost-effective and flexible way to produce customised parts. 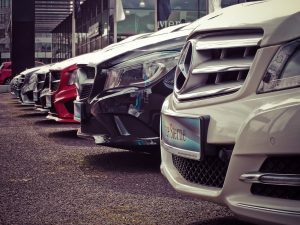 Offering customisation options to customers is one way automakers aim to improve customer experience and increase their competitive advantage. One segment of the automotive industry that has adopted 3D printing for customisation is that of luxury vehicles. In a segment were small production runs are the norm, 3D printing can be used to create parts tailored to specific customer requirements in a relatively short amount of time. 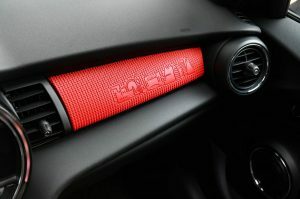 Mini is a good example: the German-British automaker recently turned to 3D printing to enable customers to order customised parts such as trim components and door handles. With an expected lead time of four weeks following the submission of the required design, it’s clear that the technology has the potential to transform the product design stage, with customers having a greater say in how their vehicles will look. Many automotive applications require materials that combine toughness and ductility with heat and chemical resistance. 3D printing with high-strength polymers (nylon), plastics (ABS, PLA) and metals (aluminium, steel alloys, titanium) are therefore the most common options for producing functional car components and tooling. Research is also being conducted into the possibility of 3D printing with carbon fibre composites, which can be used to make even lighter car components. With the possibility of producing multiple design iterations in a shorter amount of time (and at little additional cost), 3D printing is an effective tool for product development. Typically, a part must go through several design cycles before the final design is agreed upon. With 3D printing, this stage can be sped up dramatically. Additionally, cost-efficient design improvements can be made relatively quickly, since the technology does not require expensive tooling to produce a prototype. Using 3D printing for prototyping, testing and performance validation is currently one of the biggest applications of the technology within the automotive industry. Low production costs with 3D printing mean that design engineers can first check the fit and function of a component before investing into expensive and typically labour-intensive moulds for end-part production. Tooling is used extensively within the automotive industry to help produce high-quality products. Additive manufacturing can complement this process by creating jigs, fixtures and other customised tooling equipment. The Volkswagen Europa assembly plant is already using AM to produce tooling equipment in-house, rather than sourcing tooling equipment from third party providers. With a 10-day turnaround for positioning and screw assembly (down from 56 days using a third party source), AM clearly shows itself to be a cost-effective return on investment for tooling production, enhancing the overall production process. Although additive manufacturing was originally adopted as a prototyping tool, recent advances in AM technology and materials make the production of small and medium-size production of end parts possible. This can range from exterior components to inner parts such as bellows, complex ducting, mounting brackets, and engine components. One example is Bugatti: only this year, the luxury car manufacturer announced it had produced a fully functional titanium brake caliper — entirely 3D printed. With such breakthroughs in end-part production, 3D printing is set to become a key technology for this application. Automakers can leverage the benefits of 3D printing to create spare parts on demand. With high inventory costs associated with storing spare (and often rarely ordered) parts, 3D printing provides a cost-effective means to produce parts needed on time and on demand, leading to improved delivery times, reduced inventory costs and a simplified supply chain. Mass production: While automotive OEMs are increasingly incorporating AM systems into development and production, one challenge to wider adoption is production volumes. With over 80 million cars produced in 2017 alone, the automotive industry is heavily reliant on mass, series production. 3D printing should therefore not be seen as a replacement for traditional manufacturing methods, well-suited to mass volumes, but as a complementary tool for lower volume, customised end parts. Build sizes: Another challenge faced by automakers is the limited build size of many AM systems. Although larger parts can be produced with 3D printing technology, this must be done in the form of modular parts. These in turn currently have to be assembled or attached together through other processes, such as welding. However, large-scale additive manufacturing is an important and growing area of research, with technologies that can support larger build sizes, such as Wire Arc Additive Manufacturing (WAAM) and Big Area Additive Manufacturing (BAAM), actively being researched and developed. AM skills gap: Additional investment into developing AM-specific skills must also be addressed if the technology is to take off more widely. Design for additive manufacturing as well as the operation and maintenance of AM systems, materials and post-processing are all vital skills that must be developed and nurtured. While much has been said on the current skills gap for AM, partnerships with universities and internal training programmes are one way of ensuring a skilled talent pool able to work with the particularities of AM technology. As automakers continue to find new applications for 3D printing, one thing is clear: the use of 3D printing for end-part production is increasingly gaining traction. In this context, the automotive industry is likely to witness even more 3D-printed functional components, such as 3D-printed wheels, rims and even tyres. 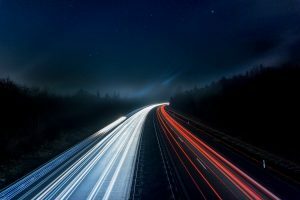 As part of the move towards end-part production, automotive OEMs will also be on the search for workflow management systems to coordinate the manufacturing process. With an increasing number of AM systems to manage, automation software, such as RP Platform, will be essential to ensure the smooth running of operations on the factory floor. And perhaps a vision of a more distant future, the prospect of 3D printing an entire car may not be so far-fetched. Chinese company Polymaker and Italy-based vehicle manufacturer X Electrical Vehicle (XEV) announced the release of an electric car with almost all exterior components 3D printed. Using 3D printing, both companies have been able to reduce the number of components required whilst also making considerable material savings. This is the sixth in our 3D printing & Industry series. To read more, why not check out our last article on 3D printing and the Consumer Goods industry?